Urban Systems staff prepared a community engagement summary after the NCP in a week to capture the community participation and energy that surged throughout the week. Image c/o Tina Atva, Urban Systems. What’s making ‘OCP in a week’ stick? OCPs, or official community plans, are conventionally prepared over several months with multiple meetings, travel and consultations involved. The name “OCP in a week” can be misleading however, because it’s not that all the work is done in a week (at least in most cases) but that the process includes a weeklong community immersion that deepens planners’ understanding of community motivations and nuances. It can also expedite the process and be more cost-effective, especially for remote communities with significant travel costs. 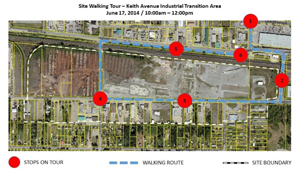 Residents of the City of Terrace were led through a walking tour in the Keith Avenue Industrial Transition Area to kick off day two of NCP in a week. Image c/o Tina Atva, Urban Systems. The goal of OCP in a week is to talk to as many people in the community as possible and to collect a variety of perspectives on how a community can evolve to address emerging challenges and meet new opportunities. During the week of Leighton’s design charrette in Tumbler Ridge, the planning team held meetings with stakeholders and the public. They presented an unpolished concept plan at the end of the week based on the information they gathered, but because of the interest they generated in the initial consultation, the presentation attracted a large number of people. Based on this experience, community planner Dylan Houlihan suggested that they turn the charrette approach into an initial community engagement process, which he jokingly called ‘OCP in a week.’ The name stuck, and so did the idea. “It helps us get a quicker knowledge of what people feel and what the area is like,” says Tina Atva of the Vancouver office. The community planner worked on an NCP (neighbourhood community plan) in a week in Terrace this spring, as well as an OCP in a week in the District of Kent in June 2012. “It gives us a chance to really be in-depth in the community, which we don’t always get to do with deadlines and budgets. It’s really quite gratifying,” she says. Sometimes the sheer act of walking around in the community, made possible by the weeklong immersion, reveals significant gems of information for community planning. 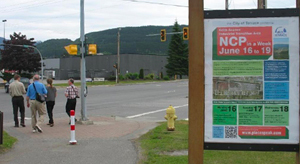 An outdoor poster publicizing the City of Terrace NCP in a week, June 16 to 19, 2014. Image c/o Tina Atva, Urban Systems. “Having spent some time in Stewart, it became evident that nobody locks up their bikes, including the kids riding to school. This tells me that the community is really safe and that this is something the community likely really values. I don’t know if that specific fact is something the community would explicitly mention and it probably wouldn’t be obvious if we were just coming in for a meeting and then leaving after we were done,” Dylan says. More Urban Systems staff are taking on the OCP in a week approach, each “adding their own flair” and providing more opportunities for experimentation and learning around what works best. The work is not necessarily easy. It requires a collective organizational effort and involves long, full days, which can be tiring. But in addition to the value add for communities, many planners have expressed that the experience is deeply gratifying. “I also hope that it has humbled us in some ways. I know in many cases, we are very reluctant to take anything out to the public unless it’s highly polished and thus would focus more resources on polishing this stuff up nicely and less on effectively engaging the community. “Now we must always emphasize quality, but we must also think about how we make our materials approachable and less ‘cast in stone’ when we are in the early stages of projects,” Dylan says.